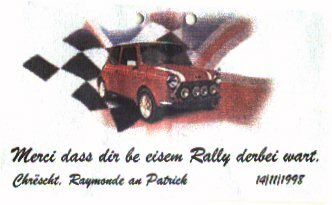 This is a report of the Sweet Mini Club Luxembourg Rally held November 14th 1998. Since he knows how much I like night-time drives, I was invited by a Mini friend, 'Andy from Belgium' for those who know him, to take part in a Rally in Luxembourg. 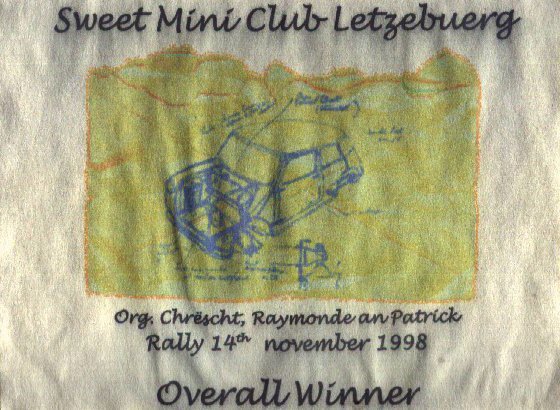 The organizing club was the Sweet Mini Club Luxembourg. Those who visited the '98 IMM in Morges might remember their green Mini/BBQ trailer they towed around there. to a full stop there to slowly advance through the water. As I've noticed before my brakes are not of much use after a long drive through heavy rainfall and this was no exception. I could easily avoid the stopped traffic by stopping on the hard should though, but the engine cut after driving through the water. Started up again without a problem though and didn't give me any trouble driving anymore. I fueled up in Liege, with the tank only being 25l and all and checked under the hood to see if everything was dry enough. Found a connector hanging almost lose on the 'bobine' (coil ?) so reattached that and carried on. A bit later though, when taking my foot of the pedal while going down hill the engine cut itself again until I accelerated again. Stopped at a parking to check the connections again but there were no problems there. It was snowing by then, so I continued my way well under my usual cruising-speed. Arrived at Andy's around 5pm, where he had a look at the carb. There was fuel coming to the carb, but not much actually going in the carb. He cleaned the jet by blowing a bit of WD40 in there and things got better from there on. Didn't have any problems on the way back. After having dinner we went on our way. It was decided that since I had been the navigator during the Belgium Mini Owners Club event in the Ardennes in September I would be driving this time and Andy would do the navigation. We arrived at 'Maison Arendt' in Leudelange around 7pm and judging from the number of people there we weren't too late. driver and two navigators in one car. Now you would think that with three captains on the same ship we would spend most time arguing in French, English and Luxembourgish, but we really didn't. We just enjoyed the drive around the neighborhood, Robert's driving, his car and did our best to find the answers to the questions. And apart from a small mistake at the start we did fairly well. Since we hadn't found the word we were quite sure that we wouldn't end up in the top ten (out of 12). So it was a big surprise to find that we actually had won the rally. Turned out that the last letters of the word were in fact spaces. Who'd have guessed ! Because of the international (Luxembourg/Belgium-English/Dutch) composition we didn't have to split the first prize; a 'self made' bottle of champagne, but would each get our own, with self made label and all. The rally was concluded by eating spaghetti together and some animated discussion, a lot of which was in Luxembourgish. At about midnight we called it a day and Andy got to drive my Van back to his place, stopping on the way to get some cheap petrol while still in Luxembourg. We got home around one and after a couple of nightcaps and some more animated discussion (and a comedyshow) we turned in ehhh... pretty late. Only to get up fairly easily. After having had breakfast I went on my way back home. It was raining again during the trip through Belgium so I didn't make good time there, but the carb problem of the day before didn't return either so I didn't really mind much. Back in the Netherlands the weather cleared up and the sun even came out. Got a little fed up with an Opel driver who kept driving on the left side, so I made room for the two Golf GTI's that were following me and of course he moved right over when he saw them in his rearview mirror... That's about as eventful as the trip back home got though and after 220km and about 2.5 hours I was back home again. So was it worth the 'long' drive ? Yes it was. Got to meet a known and some new fellow Mini-maniacs, found out what kind of needle actually is in my carb, and got to enjoy the really relaxed way the Sweet Mini Club's rally are held.